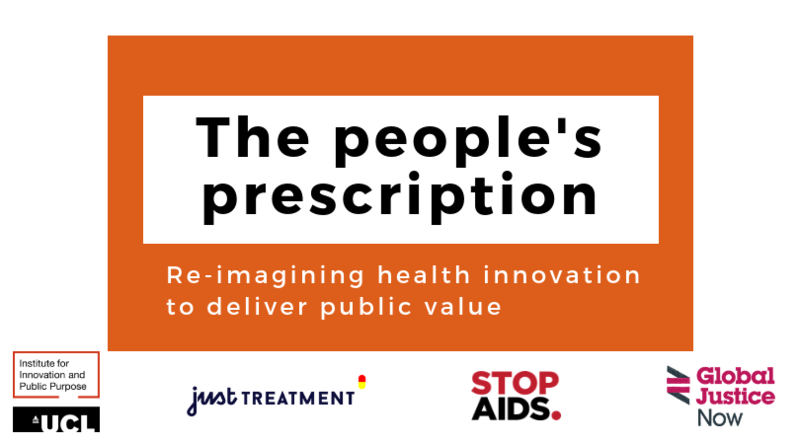 A new report from the UCL Institute for Innovation and Public Purpose(IIPP), STOPAIDS, Global Justice Now and Just Treatment on health innovation titled ‘The People’s Prescription: Re-imagining health innovation to deliver public value‘ will be launched this month. We are very pleased to invite you to the launch event for the report. This report is intended to spur policymakers into action by providing ideas, principles and policy proposals to create a better health innovation system that delivers innovative medicines for all who need them. After articulating the key problems of the current model of pharmaceutical innovation (e.g. public health needs unmet, high prices, lack of transparency, and an increasingly financialised business model), the report presents key principles that would underpin a public-interest and health-driven approach to pharmaceutical innovation: directed mission setting, collaboration and transparency, affordability and access, and long-term horizons. The remedies that follow are divided into two parts: first identifying immediate actions that governments can take to tackle the urgent crisis in patient access to medicines, and then a transformative approach based on mission-oriented research and innovation, learning from experiments across the world. We must do better! Followed by a drinks reception from 5:30-7pm.